Well, I’ve finally done it! After three years of experimentation, I’ve come up with a foolproof Ethiopian injera recipe that is quick and easy. Granted, it does not have the complex, sourdough flavor of the long-fermented injera that takes days to prepare. But it is so close to it most people, even those who are Ethiopian aficionados, can not tell the difference. For those of you who are purists, I’ll have the longer, version in my book slated to be published late this summer. In fact, I’ll have several methods of preparing injera with varying degrees of difficulty and varying concentrations of whole grains. I will also have two gluten-free versions, so there is something for everybody. If you are craving Ethiopian food and have some sourdough starter on hand, this is a bread you can create from start to finish in as little as 40 minutes. Teff, a vital ingredient in good Ethiopian injera, is a very nutritious grain from Africa and is possibly is the tiniest individual grain in the world. Injera is an Ethiopian flatbread with a consistency somewhere between a crepe and a pancake. It is spongy and flexible with a sour flavor which perfectly compliments the savory and spicy Ethiopian stews that are served on it. The injera not only is your plate in an Ethiopian meal but also serves as the eating utensil. You just tear off a piece and fold it over a mound of stew on your plate, pinch off a bite and pop it into your mouth. When you are finished with the stews, you eat the plate which has become saturated with the delicious juices of the stews! I am told by every Ethiopian chef I’ve met that it is virtually impossible to make Injera using 100% teff in the United States. No one seems to know the reason but it is assumed that it has something to do with climate and humidity. This is my version, which is quite comparable to the best of the Injera I’ve eaten in Ethiopian restaurants. In a blender add 4 cups water and 1 cup teff flour. Blend on slow initially just to combine ingredients. Use a rubber spatula if necessary to scrape the dough from the sides of the blender. Test the teff by rubbing a bit of wet dough between your fingers. In the beginning, it feels grainy like a fine, wet sand. Turn blender up gradually until on high speed. Blend for one to two minutes. You can tell when the teff is ready when it is no longer very grainy. It will never be perfectly smooth but will be much less grainy than in the beginning. Add all-purpose flour. Blend on low to combine. Turn off blender and scrape sides. Resume blending on high only long enough to remove lumps, 15 to 30 seconds. Do not over-blend. Add sourdough starter and blend to combine. While the blender is still running, add baking powder and cornstarch. Gradually increase speed to high and blend for 30 seconds. Heat a non-stick skillet with a lid on high heat. It is ready when a drop of water on the surface of the skillet sizzles and burns off quickly. Pour 1/2 to 3/4 cup batter into the hot pan and tilt the pan on all sides unit the batter spreads evenly across the bottom of the pan. The amount of batter you use depends upon the size of your pan. I use a 12″ flat-bottom skillet with straight sides with a lid. Cook on high heat for 15 seconds or until holes form on the top of the pancakes and the batter begins to firm. Cover and continue cooking until the edges of the pancake begin to lift from the sides of the pan and begin to curl. Depending on the heat of your stove, the entire process should take 1 1/2 to 3 minutes. As moisture accumulates on the inside of the lid, wipe it off with a paper towel so the moisture does not drop onto the injera and cause gummy spots. The pancake should be filled with little holes the Ethiopians call “eyes”. The injera should also easily slide in the pan when shaken. Slide onto a clean cloth on a countertop or table. I like to use flour sack towels. While the injera is cooling begin another in exactly the same manner. When the injera has cooled completely, you may stack them on top of each other. The injera must be completely cooled, not room temperature but rather cool to the touch, before they are stacked. Otherwise they will stick together and become unusable. Note- if for some reason you have accidentally folded and edge of the injera over itself while transferring to the cloth to cool (It happens to the best of us. ), allow it to cool slightly before attempting to straighten the injera. If you do it while still hot, you will make a gummy spot on the injera. If you let it cool a little, it will lay flat when you pull on it with little or no harm to the bread. This recipe should make eight to ten 12-inch injeras, depending on how thick you make them. One should be used as a the plate for Ethiopian stews. The rest should be rolled up like cigars and served on the side. These will be used to eat the stews by pinching the stews between pieces of injera. Then just pop it into your mouth! No utensils, no problem! Links to Amazon.com are affiliate links. 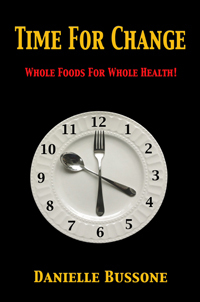 When you buy something through my links, Veggin’ Out and About! receives a small commission that helps support this site, which is greatly appreciated. It does not increase the cost of your purchase, and it helps us to continue to serve you. I post links only to products I use myself, have been highly recommended by a trusted source (which I will always disclose), or are very similar to products I use that are no longer available. Click on product to view link. I don’t know how I ever lived without a Vitamix. This is an excellent product and lasts a very long time. It is multi-functional and aside from injera, it makes it possible to make creamy cheeses from nuts and ice creams, which are virtually impossible with a regular blender or a food-processor, as well as sauces, soups and much more. I use my Vitamix every single day and have for the past eight years. It’s still going strong! This isn’t the exact sauté pan I use but it is nearly identical. The one I have been using for years is no longer available, so I’ve found one that will work well for you. I like the high sides of this pan. It makes it a little harder to slide the injera out of the pan, but the sloped sides of other pans give you less surface area to work with and you end up with smaller injera. It’s your choice. If you follow the directions in my video, you shouldn’t have any problems using this pan. I always use earplugs when working with loud electrical appliances. This is a great, inexpensive, reusable set that has a box to store them in as well as replacements for when you wear yours out. They last a very long time and are washable. Rich and I keep a pair for each of us in the fold-out drawer below our sink so they are always handy. I’ve been using this Taylor food scale for years and I have to say I really like it. It reads both in ounces and grams and allows you to reset the scale each time you add an additional ingredient, or want to weigh an item without weighing the bowl. On one of our pilgrimages to Knoxville to visit the Apple Store and the most wonderful Asian market EVER (Sunrise Market on Kingston Pike), we discovered a restaurant we have somehow missed on previous visits to this bustling city. Gosh is one of the few family-owned restaurants in Knoxville where you can find a healthy, plant-based meal without the bother of a litany of questions. Ethiopia has a long history of religious fasting days in which no animal protein is allowed, so whenever you order vegetarian at an Ethiopian restaurant, vegan is what you get. You can count on that! The menu offers individual stews a la carte from $7.99 to $8.99 each or you can opt for a vegetarian (actually vegan) four dish option from the vegetarian menu, plus a salad for $9.99. Finally, there is the option of six vegetarian dishes plus salad for $11.99. We chose the six veggie combination plate including Kik Alicha (mild pureed yellow split peas seasoned with onions and turmeric), Yemiser Wot (red split lentils cooked in a uniquely Ethiopian spice blend called Berbere), Yemiser Alicha (red split lentils cooked in a mild sauce of onion, garlic and curry), Tikil Gomen (a mild stew of carrots, potato and cabbage), Gomen ( a mild stew of collard greens cooked with onions, garlic and jalapeño peppers), Shurro Wot (ground split peas cooked in Berbere spice blend with onions and fresh garlic), as well as a house salad. This is served with a special flatbread native to Ethiopia called Injera, made from teff, a highly nutritious grain that is fermented to give the bread its unique sourdough flavor. It’s texture is somewhere between a crepe and a pancake and it is used not only as the lining of your plate, upon which the various stews are placed, but will also serve as your utensils. To eat Ethiopian food, unroll a piece of injera and pinch a portion of the stew within the folds of your injera. Then just pop it into your mouth! 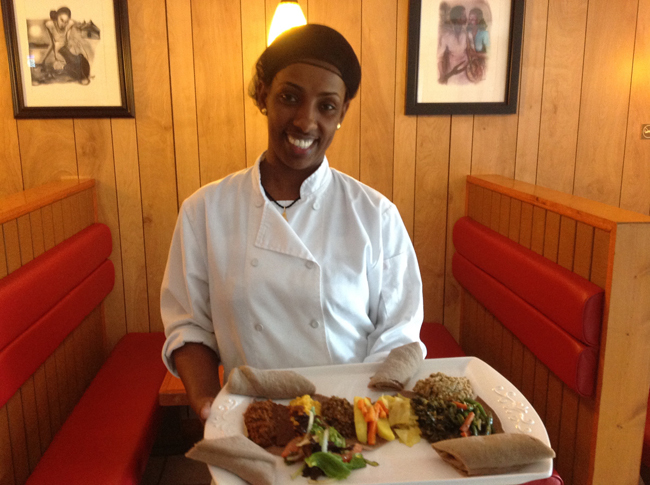 Abiye Bisrat is owner and executive chef of Enat Ethiopian Restaurant, in Alexandria, Virginia. 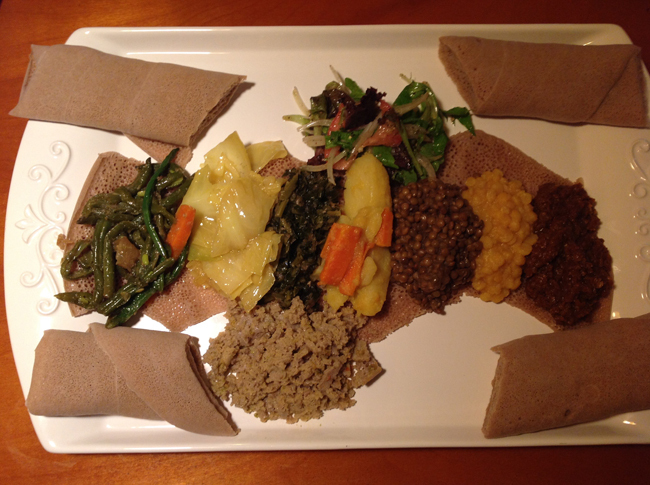 Enat (meaning “Mother”) is one of our favorite places to find authentic Ethiopian food in the DC area and we never leave DC without being sure to enjoy one of their thoroughly satisfying plant-based meals. Abiye was kind enough to prepare our favorite dish for us, Engudai Tibs, which are delicious pan-fried mushrooms. I make this dish at home but Abiye’s version is something special. His secret? Blanch the mushrooms before cooking to hold in the moisture. He also deglazes the pan with burgundy wine (or pinot noir) and he uses the spice, mitmita rather than berbere. In my version I use berbere. While they are both scrumptious, Abiye’s engudai tibs are mouthwateringly delicious and well worth attempting to make yourself. We had some technical difficulties when shooting this video. Our camera quit working in the middle of it and some of the segments were lost. Still, it will give you an overview of how this dish is prepared and I can fill in the gaps in the written recipe. I hope you enjoy this recipe as much as we do. It now holds a permanent place on our Ethiopian plate. Enjoy! Peel and julienne onion. Slice off ends of jalapeño pepper and remove seeds. Cut crosswise into thin rounds. In a hot skillet or sauté pan with a lid, sauté onion until caramelized. Deglaze the pan with burgundy wine (pinot noir). Add a little mitmita (pronounced mit-MEET-a) to taste. (Add jalapeños (karrea), add black cardamom and a little vegetable stock or water. Reduce heat and cover for two to three minutes. Finish with a few drops of good quality olive oil and a pinch of freshly ground black pepper.